Today the US and Canada are off in observance of Labor Day, nonetheless, the markets have been moving and the price action has been volatile enough to open a few forex trades. Commodities have been pretty choppy, with Gold (XAU) and Crude Oil first declining in the first few hours and then reversing back up as the European session got underway. Indices have been climbing higher slowly, making up for some of the losses from last week, although the climb looks pretty weak so I don’t think this is a trend reversal just yet. The USD seems to be in demand as it gains against safe havens, with USD/JPY and USD/CHF slowly trending up. But again, I don’t see this as a trend reversal after the downtrend of last week, because the climb looks pretty weak here as well. The main action in financial markets today took place in GBP pairs. GBP/USD opened with a 45 pip gap lower after EU’s chief Brexit negotiator Barnier commented during the weekend that unless there is a solution on the Irish border, a Brexit deal will be hard to reach. This morning, the UK manufacturing data missed expectations and that gave the GBP a second push lower. But, I don’t think we will see much action from now on as we head towards the end of the European session. Swiss Retail Sales – Retail sales were expected to increase by 1.2% in Switzerland but instead, they declined by 0.3%. Last month was also revised a tick lower so this was a negative report overall, hence the slight bearish bias of the CHF. Italy Will Respect the Debt/GDP Budget Rules – Recently, we have heard rumours from Italian officials that Italy might exceed the 3% EU rule of budget debt to GDP ratio which has raised a few eyebrows. But, the deputy Prime Minister Mateo Salvini said today that he would like the budget deficit to be close to 3% but below it. These are some reassuring words, but we will have to wait for next month when they present the budget to the EU. 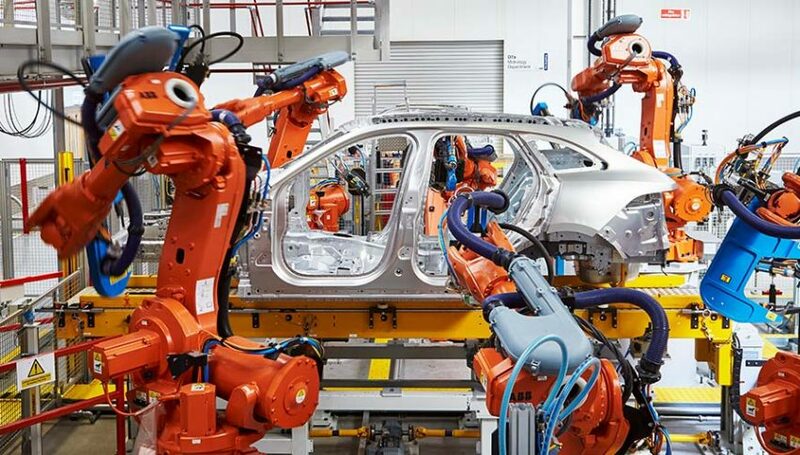 Spanish Manufacturing PMI – Just like in Britain, the trend in Spanish manufacturing has been declining in the last several months, but today the actual number beat expectations as they came at 53 points against 52.5 expected. This might be the beginning of a trend reversal, but it is too early to tell. Italian Manufacturing PMI – The trend in Italian manufacturing has been bearish as well in recent months and, unlike in Spain, it got even worse today. The manufacturing index was expected at 51.2 points today, but it came at 50.1 PMI points. This is very close to contraction although let’s wait for next month once again. Eurozone Final Manufacturing PMI – German and French manufacturing were little changed this month, while Spanish manufacturing numbers were positive and Italian ones were negative. So, the final Eurozone manufacturing figures came as expected at 54.6 points, unchanged from last month. Although, the trend here is bearish as well because it has declined steadily from around 56.5 points back in spring. British Manufactuirng – The decline in the British manufacturing was a bit of a surprise today. It was expected at 53.9 points but came at 52.8. the GBP lost around 40 pips after the release of the report this morning. CBT to Hike Interest Rates Again This Month – The central bank of Turkey is going to meet on September 13 and they said that they will not hesitate to take the necessary steps, meaning hike interest rates. That sent the Turkish Lira higher today and will likely help it some more when they increase the rates again, but that won’t tackle the problem in the long term. Chequers Proposal the Only Brexit Plan – The UK spokesperson for the Prime Minister said that the Chequers proposal was the only credible Brexit plan. This means that we will end up with no Brexit deal then because the EU didn’t exactly agree to that. Mark Carney Is Leaving the BOE – The head of the Bank of England Mark Carney finishes his term next year and he has said a few times that he will leave and not ask for a second term. Although, this morning the UK treasury is said to be in talks with the BOE for Carney to stay. Later, the UK PM spokesperson James Slack said that Carney is expected to step down next year and that is still the plan. So, Carney hasn’t accepted the proposals from the Treasury then. CBRT to Hike Interest Rates Again – The Turkish central bank and the Ministry of Finance said today that they will take action to tackle the price volatility of the Turkish Lira. That means only one thing, hiking interest rates again after they hiked them by 1.50% a few weeks ago. Despite the first hike, the Lira is still pretty volatile and weak, so I don’t think that just hiking rates will finish the job. Labor Day in US and Canada – The US and Canada are off today for Labor Day which is an excuse to have a long weekend holiday at the end of summer. Therefore, expect the market to calm down and die out as we head toward the end of the European session. 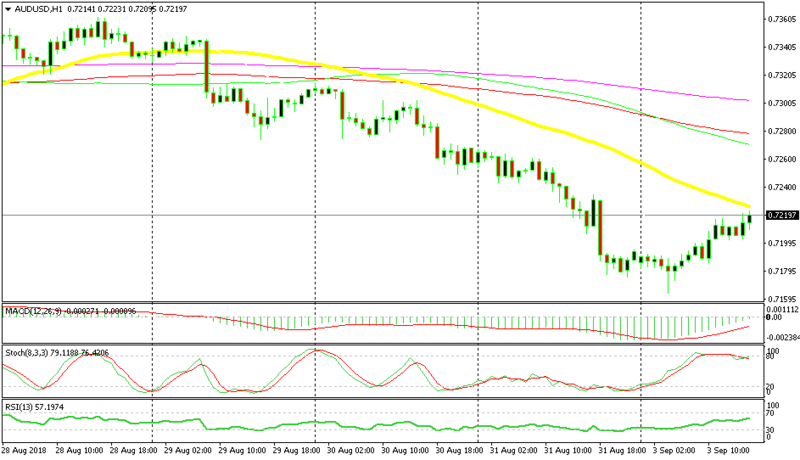 AUD/USD turned bearish last week as fundamentals deteriorated. Australia expelled the Chinese giant Huawei last week and the economic data has been pretty disappointing since then. So, AUD/USD has turned bearish. Although, this morning it has been retracing higher but it seems that the retrace looks compete now. The 50 SMA (yellow) is just standing above and it is providing resistance. So, we decided to go short on AUD/USD and it seems like the reverse is about to take place. The European session is drawing to a close now and the US is off, so I expect the price action to die off in forex. Bitcoin is making some nice moves, but we already have a long term signal open in Bitcoin so we will just keep that signal on since it is already in profit.